After breakfast, drive to bago (84 km - 1½ hours),an ancient capital of Mon, known as Hansavati. Stop en-route by an Allied War Graves cemetery near HtaukKyan. Arrival to Bago, visit the four giant Buddha images at Kyaukpun Pagoda,which was built in 15 century by King Damazedi famous for its background story and 4 giant sitting images are back to back, theShwetharhlaung Pagoda, with its giant reclining Buddha, having a history over 1000 years old, the Shwemawdaw Pagoda, with 114 meters the highest pagoda in Myanmar, and CherootFactory. 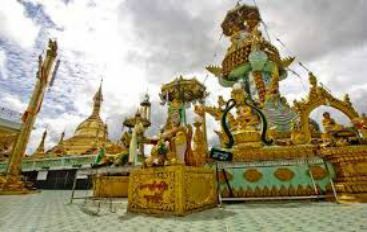 The tour will continue to one of Myanmar's landmarks, famous for its precarious position and religious importance, Kyaikhtiyothe 'Golden Rock', a huge boulder completely covered by gold leaf and delicately balanced on the edge of a cliff. To reach the pagoda from Kin Pun a steep 11 km road leads to the upper staging point by truck. The upper area must be traveled by foot, at present, and walk approximately 4 km (1 hour) up a steep path and ascend some 500 m to the Golden Rock Pagoda. On arrival you can enjoy great views over the surrounding jungle and a beautiful sunset. After breakfast, walk down to Rathedaung(transit camp) and take the truck car ride down to the base-camp. Proceed to Mawkamyine (170 Km, 4 hour). Upon arrival in Mawlamyine, check in at hotel on Strand Road among historic buildings from colonial era. 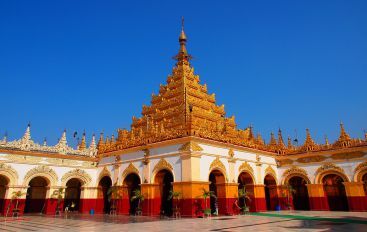 Afternoon sightseeing includes Zeygyi Market which is the central Market in Mawlamyine, Mahamuni Pagoda, a major temple site in Myanmar and Sein Done MibayaKyaung, where King Mindon’squeen sought refuge and enjoys the sunset at Kyaikthanlan Pagoda. After breakfast, drive to Kyaikamie( 82 km , 2 hour ). The area between Mawlamyine and Kyaikamie which will have to be passed is Kyauktalone, a Buddhist Stupa and a Hindu temple facing each other and the huge Reclining Buddha image. Afterwards proceed to Mudon, and visit huge reclining image.Then to "Thanpyuzayat" to observe notorious Death Railway of WW II cemetery containing more than 3000 graves of Allied POWs who toiled on the Death railway connecting Thailand and Myanmar. Afterwards, proceed to "Kyaikamie" where one can visit "KyaikamieYela`" Pagoda (Pagoda amidst water). Afterwards, return back to Mawlamyine. After breakfast, drive to Kyaik Ma Yaw and visit Kyaikmayaw Pagoda. Then drive to HPA-AN( 1½ hour ), the capital of the Kayin State. 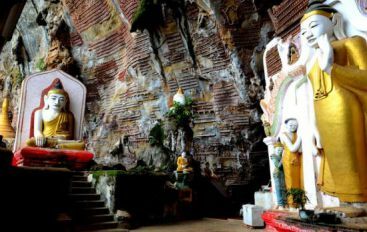 En-route, visit Kawgoon Cave where images and wall-carvings can be seen inside the cave and Payon, famous for its countless Buddha images, stalagmites and stalactites. Arrival to Hpa-an, check-in at the hotel. Then, visit to Mt. Zwekabin which stands as an attraction for nature lovers. Hike up to the hilltop taking steep and narrow winding road. Enjoy the cool mountain air, peace and tranquility combined with panoramic view. After breakfast visit the local market and proceed to Shweyinhmyaw Pagoda located at the bank of the Thalwin River. Then depart to Yangon. En-route explores a network of limestone caves extending through the whole mountain range opening to a picturesque lake.